Beautiful plantings that clean stormwater have been installed in Glenwillow! These planting areas are called bioswales and have been designed to reduce grease, oil and sediment from flowing into Tinker’s Creek, helping to improve the overall health of the creek. 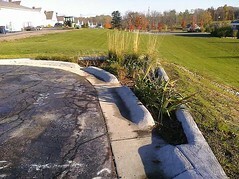 Seven bioswales were built on Village properties including the existing parking lot behind Village Hall, within the Village Town Center Park and in front of the Village Building Department. Volunteers planted these areas with deer resistant colorful, flowering perennials. In addition to these bioswales, hundreds of shrubs and dozens of trees were planted along Tinker’s Creek near the Pettibone Road bridge. At maturity, these plantings will help shade the waterway and will play a key role in increasing water quality, habitat diversity and reducing erosion along the creek. Why is the health of Tinker’s Creek important? Almost two miles of Tinker’s Creek lies within Glenwillow Village and Glenwillow is the only municipality within the watershed where the entire area drains into the creek. Tinker’s Creek is a large tributary to the Cuyahoga River, which flows into Lake Erie - Glenwillow’s drinking water source. The Village of Glenwillow received a $63,050 grant from the Ohio Environmental Protection Agency under the provisions of the Surface Water Improvement Fund and the US EPA Great Lakes Restoration Initiative to pay for 100% of this project.